Walk in showers are space enhancing, easy to clean and maintain and give a bathroom a cool, high-end minimalist look. But there can be drawbacks to consider. With an open-plan shower you can have the problem of water escaping; and some people are put off by the lack of privacy and the fact that it can feel draughty, especially in winter. These disadvantages can easily be overcome with an Optiwhite™ glass frameless shower screen, made to measure to fit seamlessly. This tough but barely there clear glass for your shower will contain the water spray to keep the rest of your bathroom dry. It will also give you all the light and indulgent feel of a walk in shower, without feeling too exposed or chilly. For more inspiration see our case study of a Moroccan-style walk-in shower in Loxwood in West Sussex. If you are planning a luxurious, frameless, walk-in shower, Showerpower™ can ensure you achieve the ultimate in both style and practicality. Showerpower are the UK’s leading experts at creating stunning glass designs for walk-in showers and wet rooms. Our designers understand how to maximise the feeling of light and space in any layout and our glass screens are installed by our own, highly experienced teams. Find out more here. Planning a walk in shower? If you are ready to explore glass options for your new walk in shower, call us on 01403 829020 or contact us by email today. 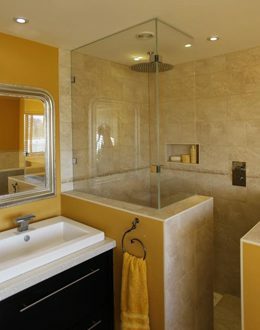 We specialise in bespoke frameless glass screens for showers and bathrooms in London, Surrey, Sussex and across the south east of England.